Your most memorable Valentine’s Day yet is waiting on the water, when you and your sweetheart join us aboard the Odyssey for dinner. Take a romantic 3 hour gourmet dinner cruise on a high-end luxury yacht with the stunning skyline of Chicago as your backdrop. Climb aboard your recently renovated vessel, featuring a sumptuously-appointed rooftop lounge and stylish interior design, for your cruise along Lake Michigan. Then sit down for a 3-course dinner, informed by some of the world’s top celebrity chefs and composed of fresh ingredients cooked right onboard. After dinner, enjoy coffee and tea, captivating views of Chicago landmarks such as the Willis (formerly Sears) Tower and John Hancock building, plus musical entertainment provided by the onboard DJ. 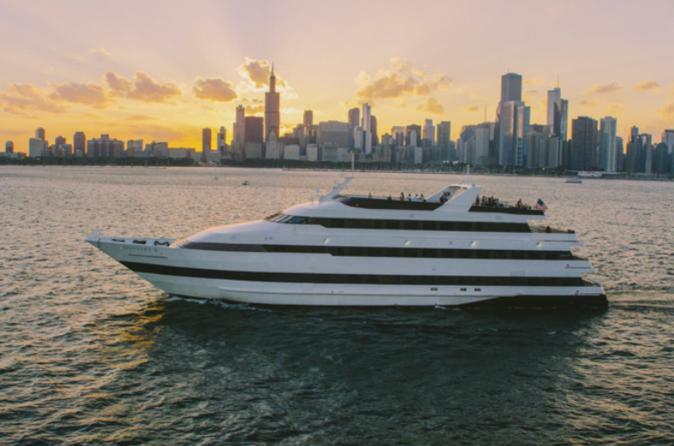 Spend an exceptional evening cruising the shoreline of Chicago onboard a luxury yacht, admiring the city’s striking architecture as you enjoy a gourmet, 3-course dinner. It's an experience unlike any other and the perfect venue to celebrate love with your special someone. Make your way to Navy Pier on the evening of your cruise, making sure to dress to impress for this festive evening. As you make your way through this famous entertainment complex, enjoy the bustling mix of pedestrians, street performers, and lakeshore views found at this famous pier. Then step onboard your yacht to begin your unforgettable evening. You’ll have your picture taken by the ship photographer to help capture the moment. Then follow your host as you’re whisked to your table for your meal. The servers will introduce themselves and offer you the chance to decide how you’d like them to pace your meal. Musical entertainment is provided by the onboard DJ, who will keep things lively with a mix that covers everything from classic jazz to more contemporary hits. When you have a few moments, make sure to explore the ship’s luxurious design and amenities. Ranging from the temperature-controlled dining area to the observation deck, you’re sure to notice the vessel’s attention to detail and unique art-deco interior accents, most of which pay homage to the classic ocean liners of yesteryear. Make sure to also stop by the Captain’s bridge, an area that’s open to all guests for the majority of the cruise.